Welcome back, once again, friends! It’s been a little over a week since we returned from our grand DC adventure and I’m just now starting to organize my pictures and think about putting them on the internet. It’s a slow process. I took a lot on my phone and a lot on my camera and now I have to consolidate them. I thought about all the posts I could make about all the things I did while I was in DC, but I figured it would be easier to do a list instead and get them all out, rather than risk forgetting any. Here are the ten things I did in DC. We don’t have a terribly impressive public transportation system in Pittsburgh. I’ve never even ridden on a public bus, to be honest. I grew up in a very not urban area where you would have to drive to a bus stop to ride the bus and at that point why not just drive? 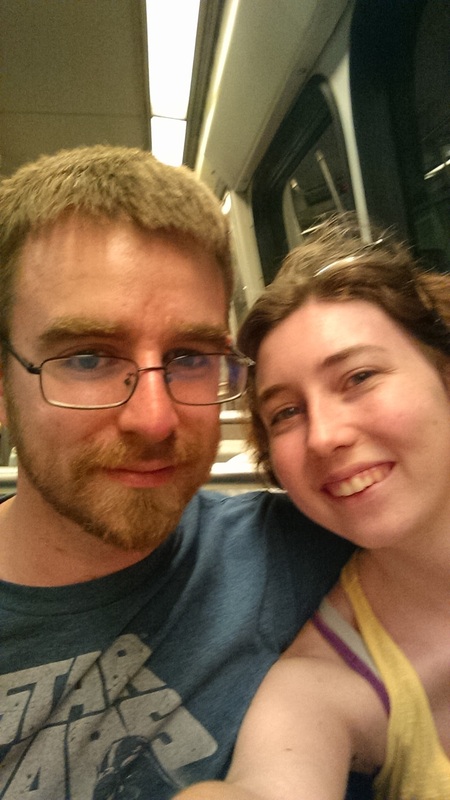 DC on the other hand has a great public transportation system in the Metro which was super cool to use, actually. Instead of trying to navigate the city and find parking and stuff, we just parked at the metro station, quite cheaply, got metro cards to pay our way through the week and hopped on the orange line into the city, which took us most places we needed to be. We did have an adventure figuring out the system and finding out that you don’t want to listen to Google maps because it’ll tell you to go to a station that the line isn’t running to that day and then you’ll have to go back down the yellow line and get on the red line to go to a station which was closer to your destination anyway. Ah well, we figured it out after the first day and aside from timing issues all went really smoothly. When we decided to plan a DC trip we each kind of picked a thing we wanted to do. Molly wanted to see the pandas, so see the pandas we did. Logan and I met the family at the zoo about an hour and a half late because of our metro adventure and they spent most of that time looking at pandas. Then we went in and looked at them again and came out and Molly went back in to get a picture with them and ended up spending another half hour at least looking at the pandas. To be fair, they were super cute. There’s a mom and a dad and two little ones now. The youngest is named Bei Bei and I have his picture on a water bottle. He turned one the Monday that we left. I didn’t get to see his sister Bao Bao, who I just learned is a girl, but Molly did. Bei Bei was pretty adorable, though. He was sleeping with his mom in one of the indoor enclosures. The big Panda, Tian Tian, went outside when we came in so we went outside to see him lumbering around. He was so funny and kept posing for pictures. 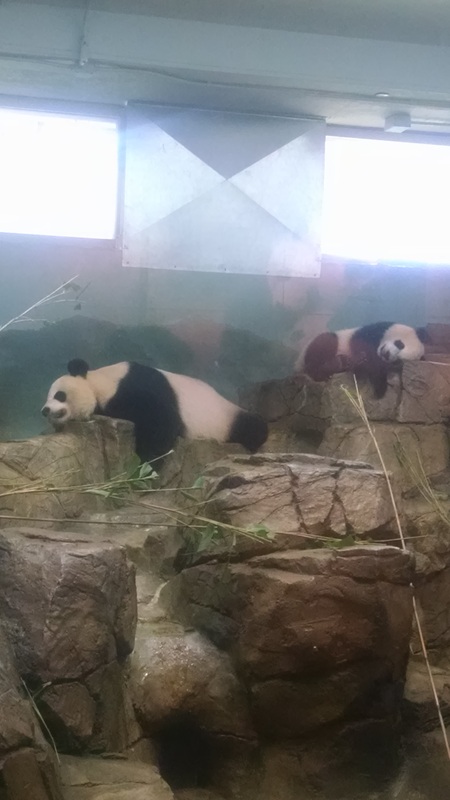 We saw the rest of the National Zoo as well, but the pandas were by far the most exciting part. Basically all you do in DC is walk. You walk from the metro to places, you walk in places, you walk around places, you just walk everywhere, all the time. My husband logged nearly 20,000 steps the day we went to the zoo. I only logged 15,000 steps, but my phone was also off so it could charge while we walked to Dunkin Donuts from the zoo. Walking around the zoo was the hard part. It was super hot and super humid that day. It was hot all week, but that day was definitely the worst. We kept trying to find indoor enclosures to get out of the heat. The day we got there we walked up and down Old Town Alexandria and kept popping into little shops just for their air conditioning. The museums were nice because they were all cool inside, sometimes too cool inside, but they are still huge and require a lot of walking. We walked around the National Art Gallery, the National History Museum, the Air and Space Museum, the Spy Museum, and Ford’s Theater. We thought about doing swing the Saturday we were there, but our legs just couldn’t handle the thought of that much movement. You may laugh at me for this one. I realize that when you think DC lobster rolls aren’t the thing that first comes to mind, but I was super pumped about them. We went to a slightly more expensive sea food restaurant the first day we got to DC after walking up and down Kings Street. It was a really cool place and the food was wonderful, if pricey. We looked the menu over before going in and decided it was probably worth it. I honestly debated on just getting clam chowder, because it is the most wonderful soup of them all, but I couldn’t resist the call of the lobster rolls, no matter how hard I tried. They’re a thing we got in Maine and you just can’t get in Pittsburgh. They make them, sure, over by Wholey’s, but they put a bunch of stuff in them that doesn’t belong and it’s just not the same. So I was a bit nervous getting lobster rolls not in Maine, but I did it and they did not disappoint. They were basically almost exactly the same as what we got on our honeymoon and I was so pleased. Okay, I can’t actually say that because we did cut out before the American Art Museum, which the family went to after the Spy Museum, but we did see the National Gallery and walk all over the second floor and looked at basically every painting imaginable. These were Lauren’s picks and she kept going long after the rest of us had run out of art enthusiasm. 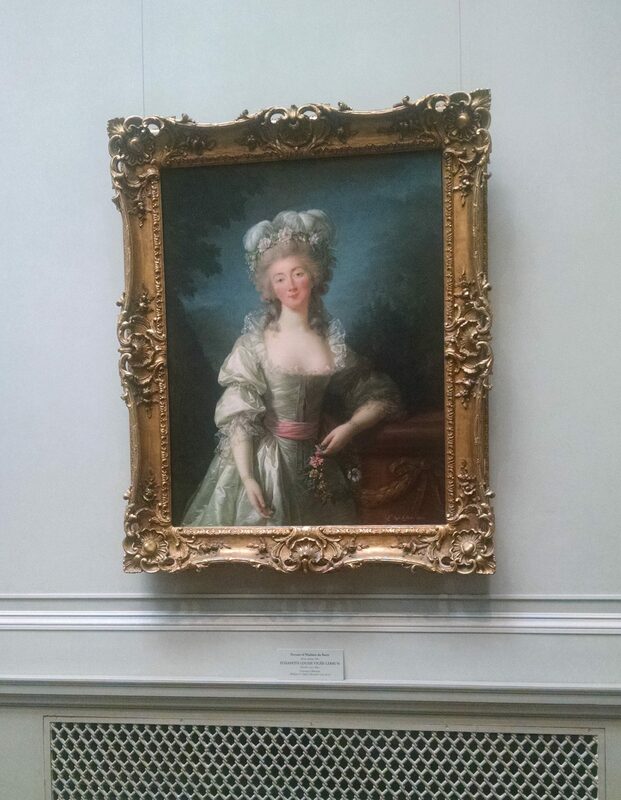 I found an app, though, that played a little commentary about some of the paintings as we went, which was most helpful. It was neat to be able to sit and listen to a little bit about the artist and their intentions with the painting and get a little explanation on what’s going on in the piece. I’m not great with symbolism in visual mediums, so that was cool. There was a security guy who was a little bit intense about his job. I’m pretty sure he scolded each of us at least once during the whole visit. But aside from him, and the impressive amount of walking we did, we had a lovely time. Logan wanted to see the Air and Space museum, because he loves space. Unfortunately the time slot for that was after the zoo so we only had a few hours to take a look at it. My poor husband refused to sit down at all for trying to see everything possible in the time we had and almost fell over a couple times because of it. 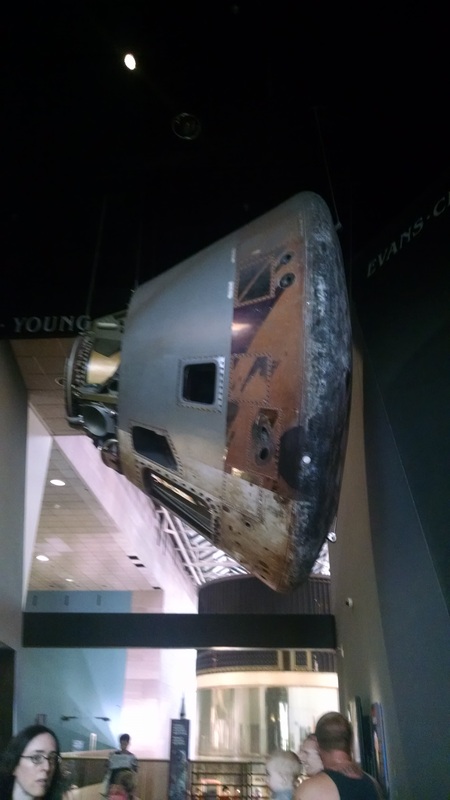 I will admit, the space stuff was pretty cool, but I was more interested in the air part of the museum and the history that went with it. My pick for the vacation was the American History Museum, which my mom-in-law had also picked. We also had a shorter time for this visit because it was after the National Gallery, so we didn’t get there until like 5. It was pretty cool, though. We got to see all the first lady’s dresses, which was so neat. I love historical fashion and it was so cool to see the actual garments worn by our country’s leading ladies. The history of war exhibit was also really cool. I thought it was a little funny that World War I got a little tiny section and World War II was probably the biggest portion next to the Revolution. We ended our trip with a visit to Ford’s Theater. That was Dad’s pick and it got pushed to the last day we were there. It’s really cool, though, the journey they took you on through his life and presidency leading up to his assassination. We got audio guides for each of us to listen to as we went through the museum, which extended to across the street where Lincoln actually died. My favorite part of the whole thing was the timeline of the day Lincoln died which contrasted his final day with Booth’s day leading up to the shot. Lincolns final action on the timeline was to hold his wife’s hand and tell her the couple with them wouldn’t mind it. What is a trip to DC without seeing the memorials? Naturally, we chose the one day it rained to go and see them, but you know, whatever. It was quite soggy, but very interesting and a little appropriate, I think, for the somber tone of the war memorials. We made our way to Lincoln, first, naturally, as he had cover and he’s the biggest. You don’t realize what a cool tribute it is until you get there. They have two of his speeches inscribed in giant letters on either wall. I think it’s easy to forget how truly impressive he was with words. We followed that up by swinging around to the Vietnam memorial, which was the one I really wanted to see. It really is surprisingly moving for how simple the design is. I watched a documentary on it once for a class on communication and it was very cool to see it in person. We crossed back over to the reflecting pool and walked up to the WWII memorial, which was also so cool. There was a guide there who explained to us about the design of the memorial and how the states are set up as if it were a military banquet, with the soldiers who died as the guests of honor and each state seated according to rank and seniority. It was so cool. This was the last monument we saw with the family. We saw the Washington monument on our way back to the metro, but didn’t really stop to look at it, other than to get a picture. I will admit, by this time in our trip I wasn’t sure I super wanted to do more walking, but I’m glad that we did. You already know this. 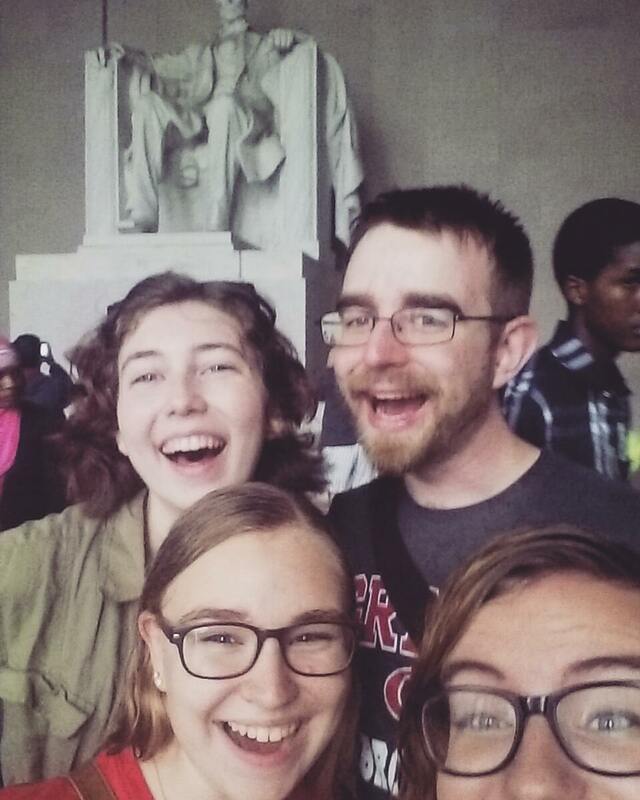 I just told you how we did the monuments in the rain, but you don’t really understand just how wet it really was. It was a dry beautiful day when we left in the morning and as soon as Logan and I stepped out of the metro station and into the street it started to pour, and I do mean pour. We had to run and duck into a covered bus stop to figure out what to do for lunch while we hoped the rain would lighten up. It did for a little and started pouring again by the time we got to our food destination where we hung out for a while longer than we needed to, hoping it would slow down. My poor in-laws had no umbrellas. I was the only one with any kind of cover because I’d been carrying my sun/rain parasol all week for shade, because I am the whitest of the white humans. So I was dry for the most part, except my shoes and socks, which were quite soaked by the end of the day. All of my family were just soaked through by the time it cleared up near the end of the WWII memorial. On top of running around in the rain seeing monuments, it also stormed the night after we got there and the power went out in my Twirly’s apartment. It came back on around 2 am. This was the only thing we had to pay to do the entire weekend, but it was worth it. The International Spy Museum was really neat to visit as they send you in under cover and everything and give you some tests along the way to see if you’ve kept your story straight. I was under a little bit of suspicion after my first test, but I passed the exit exam with flying colors and was not arrested in the airport. But really, it was so cool to see all the little gadgets that they used in spying way before that kind of technology was public knowledge. They have itty bitty cameras that fit in things and tiny listening devices and all sorts of cool contraptions that you’d never think they could use in the 50’s. The history part was, of course, my favorite. I loved seeing all the information about the civil war spies and the evolution of espionage. I was disappointed, though, that the room that talked about George Washington as a spymaster and Ben Franklin’s contributions did not mention Hercules Mulligan at all. Seriously, he needs more love. 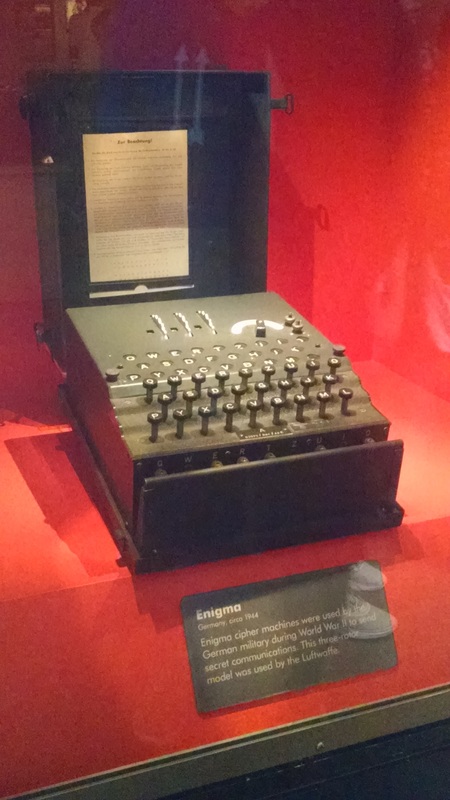 My husband was super excited to see Alan Turing memorialized in the museum, though, along with the enigma machine. #10. Ate the best pizza. You can laugh at me for this one, too, but seriously, it was the best. There’s this tiny chain of fast food pizza places in DC called &pizza. There are like three of them in DC and in a handful of other cities, but that’s it and it’s super sad. They’re basically a subway for pizza where you pick your dough and toppings and whatever and they put it together in front of you and send it through the oven where you can put more stuff on it on the other side. They also have standard options for you to pick from if you’re too intimidated to make your own. I had the best white pizza ever with grilled onions and real mozzarella crumbled on top. We really wanted to go back before we left but we didn’t get a chance. Seriously, though, if you happen to be in DC sometime, you need to check this place out! So those are the high lights; that’s what we did in DC in a nutshell. We also went out to eat and played board games with Twirls and Ryan and got bad directions to the Air and Space Museum and watched some sea lions being surprisingly cute. There’s so much more we could have seen and done, but for one vacation I think we did pretty well. Next year, though, I think we’re going to try for something a little bit more relaxing with less walking involved. I hope your summer was as successful as mine, dear friends!